Let’s take a look at the top 10 WWII Infantry Rifles of WWII, both Allied and Axis. The M1 Garand was the standard U.S. Army infantry rifle from 1936-1959. A semi-automatic rifle that General George S. Patton called “the greatest battle implement ever devised”, it gave U.S. G.I.s a huge advantage in World War II. Whereas the German, Italian, and Japanese armies still issued bolt-action rifles as the standard for their infantry, the M1 was semi-automatic and retained high accuracy. Among the obvious advantages this provided, it led to the Japanese strategy of a “banzai charge” being far less effective, since they now faced an enemy with a high rate of fire. The M1 could also be accessorized with a bayonet or even a grenade launcher. The British Lee-Enfield No. 4 MK I became the standard issue infantry rifle of Britain and the Commonwealth states in 1941, extending a long line of updates to a bolt-action design that began in 1895. In fact some forces, like the Bangladesh Police, still use a version of the Lee-Enfield, making it the longest serving bolt-action rifle in history. Across all models, over 17 million Lee-Enfield rifles have been made. Canadian Sgt. 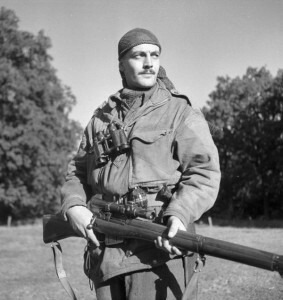 Harald Marshall carrying a Lee-Enfield No. 4 Mk I fitted for sniper service. What the U.S. issued M1 Garand had in its rate of fire, the Lee-Enfield made up for in accuracy. With a ladder aperture sight calibrated for 200-1,300 yd, British infantry in World War II had amazing range and precision, firing .303 rounds from their Lee-Enfields. It could hold up to ten rounds loaded with 5-round charger clips. A Remington Rand-made Model 1911A1 of the U.S. Army. One of the most popular handguns ever made, the Colt 1911 set the standard for the 20th-century pistol. The standard issue sidearm for U.S. Armed Forces from 1911 until 1986, the Colt 1911 has even been modified and for use in various service branches to this day. The Colt 1911 was developed by Browning during the Philippine-American War because troops needed more stopping power from their weapons. The .45 caliber rounds of the Colt offered just that. 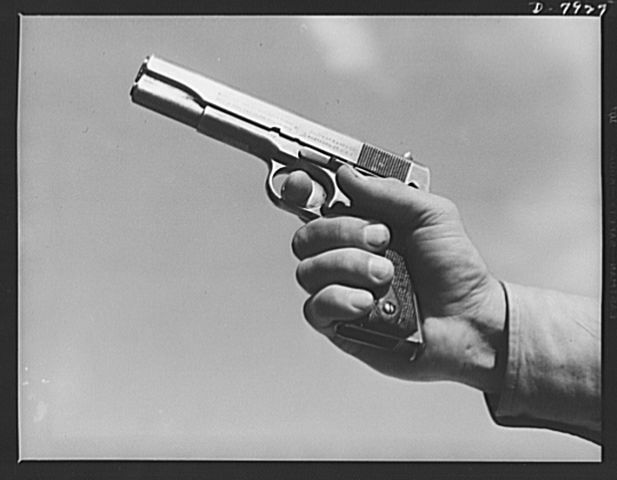 It was a reliable and powerful sidearm for U.S. infantry during World War II. 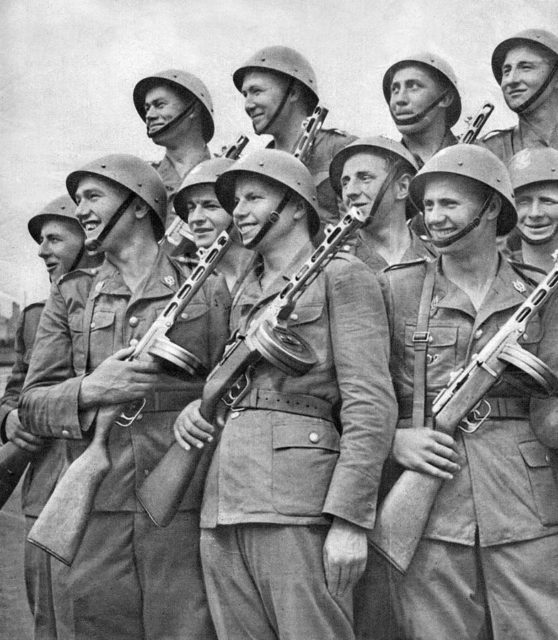 Polish soldiers with the PCA , 1951. The PPSh-41, or Shpagin Machine Pistol, was the Soviet Union’s sub-machine gun of choice for World War II and over the many years that followed it. Made mostly of stamped sheet metal and wood, Russian factories were at times producing up to 3,000 of these weapons each – every single day. Cheaper and faster to make than the Soviet Union’s previous sub-machine gun, the PPD-40, the PPSh-41 was also more accurate. And with whole companies being equipped with this beast that could fire up to 1000 rounds per minute from drum magazines that held 71 standard Russian pistol rounds, Russian infantry firepower was on the rise. 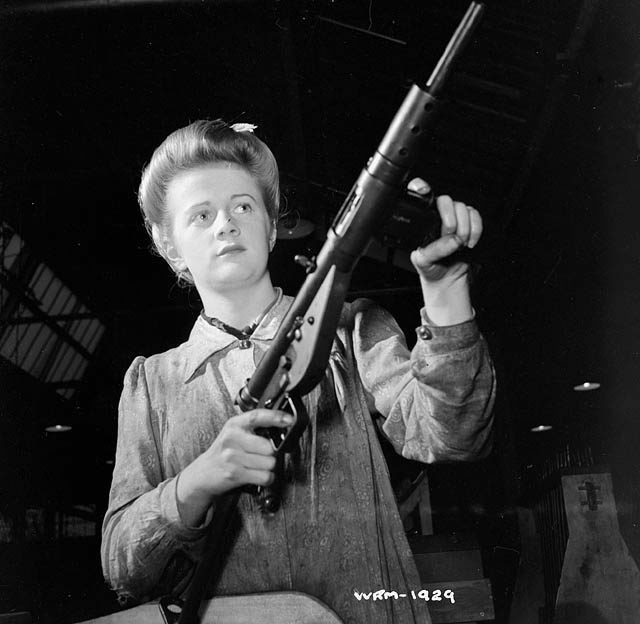 Worker posing with a Sten Mk II in the factory on 26 May 1942. The British Sten Gun was a sub-machine gun, created out of sheer necessity. After losing huge amounts of equipment during the evacuation of Dunkirk and now with the looming threat of German invasion, the United Kingdom needed some strong infantry fire power, quickly and cheaply. To that end, the Sten Gun fulfilled its purpose. Its simple design was mass-produced and sub-contracted to factories all over England. Though the finished project was often rough and was plagued by frequent reports of misfiring, it was the punch Britain needed. 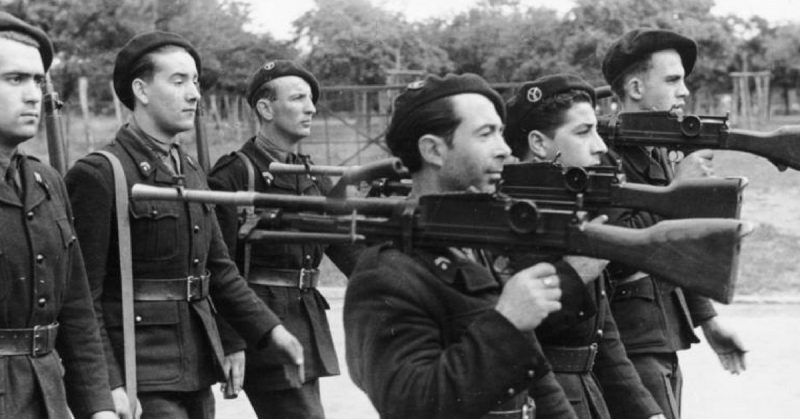 It was so simple to build that many countries and partisan forces started producing their own, including Polish Resistance which made at least 2,000. 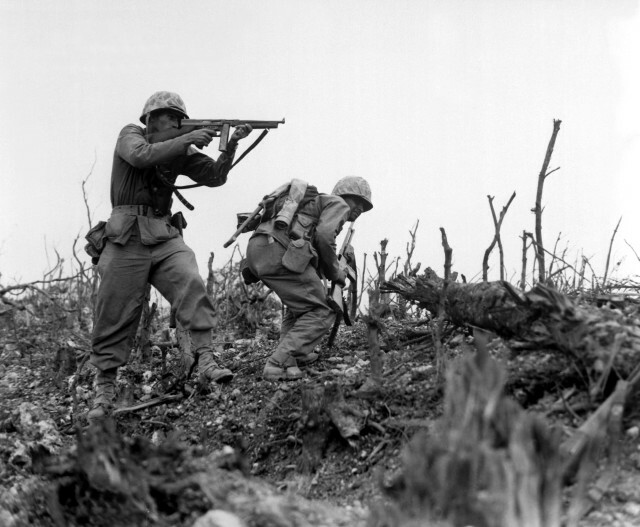 U.S. Marines with Thompson submachine guns on Okinawa in World War II. The United States produced over 1.5 million Thompson Submachine Guns during World War II. Already iconic for its U.S. prohibition-era use by both criminals and police, this recognizable weapon was especially treasured by paratroopers for its effectiveness in close-quarters combat. The model mass-produced for the U.S. Army, beginning in 1942, was the M1A1, which was simpler and cheaper. Usually equipped with a 30-round magazine, the Thompson fired .45 caliber bullets – very common for the U.S. forces at the time – and provided excellent stopping power. 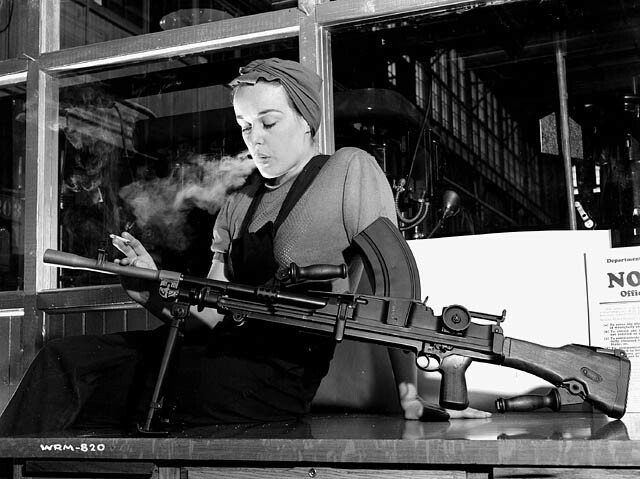 “Ronnie the Bren Gun Girl” in Toronto, Canada, with a finished Bren Gun, 1941. The Bren Light Machine Gun was a powerful, easy to use weapon that could always be relied upon and was the linchpin to British infantry platoons. The licensed British model of the Czechoslovakian ZB vz. 26, the Bren was adopted by the British Army as their main light machine gun and they placed three in each platoon, one per rifle section. It was said a soldier could fix any problem with the Bren by just hitting it or adjusting the regulator for the gas piston. Equipped to take the .303 round used in the standard issue Lee-Enfield bolt-action rifle, the Bren was fed by a 30-round magazine (100-round pan magazine for anti-aircraft use) and could fire at a rate of 500-520 rounds per minute. 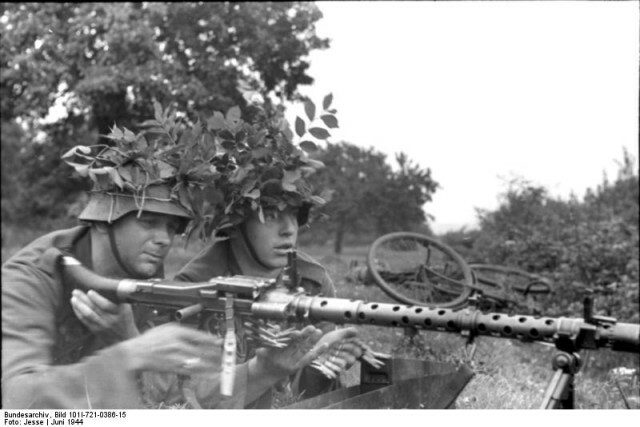 The Bren and its Czech equivalent have been used by armies all over the world, even to this day. 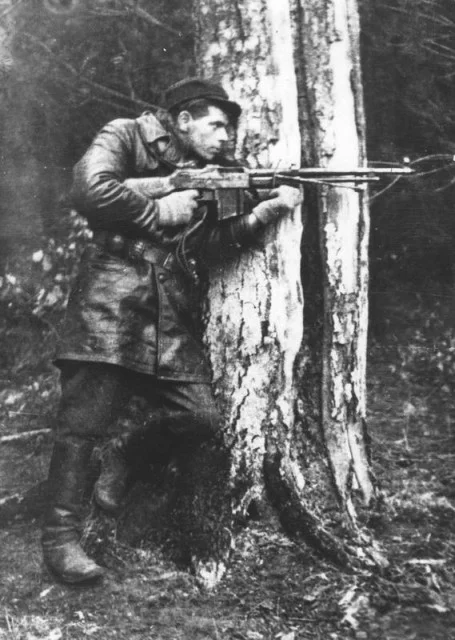 Polish partisan with an M1918 BAR. The 1918 Browning Automatic Rifle was the light machine gun standardized by the U.S. Army in 1938 and used up until Vietnam, seeing extensive use with U.S. World War II infantry. 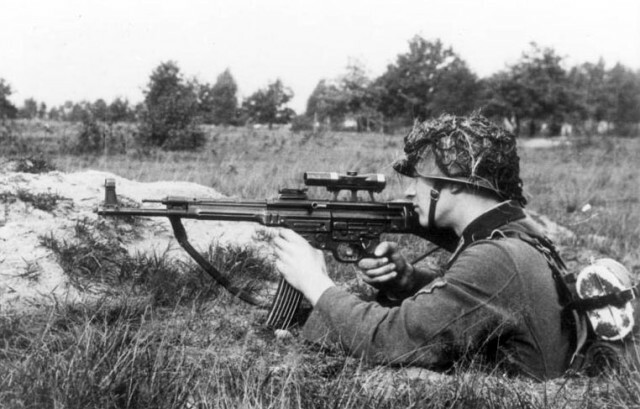 Though the U.S. never developed a light machine gun in the Second World War as practical and powerful as the British Bren or German MG34, the M1918 BAR still did the trick. Weighing between 13 and 24 pounds, depending on the model, and firing .30-06 rounds from a cartridge that usually held twenty, the BAR was originally indoctrinated as a rifle support weapon. When the U.S. began exchanging fire with German troops armed to the teeth with automatic weapons, military doctrine switched to focusing rifle squads around at least two BARs, as the center of their tactics. The Maschinengewehr 34 was one of the weapons that gave the infantry of Nazi Germany such a heavy punch. One of the most reliable and well-crafted full machine guns of World War II, the MG34 was unmatched in rate of fire, which could reach 900 rounds per minute, and could be carried by one man. It was equipped with a double-cresent trigger which allowed for semi- and full-automatic fire. When carried into battle, the MG34 could be fitted with drum magazines capable of carrying up to 75 rounds. As a defensive weapon, it could be continuously belt fed with an easy barrel exchange to avoid overheating. Though updated to the MG42 which was easier to produce, the MG34 was the quintessential German infantry machine gun for the War. The StG 44 was developed in Nazi Germany in the early 1940s and began mass production in 1944. After several years of pushing down the idea of a new automatic or semi-automatic in the style of the StG44, Hitler had asked his top commanders on the Eastern Front what they needed – and this was their answer. In one of their last attempts to turn the tide of World War II back in their favor, the Wehrmacht had over 425,000 StG 44s made. Sturmgewehr, or storm (assault) rifle in English, was the first mass-produced assault rifle and has changed warfare drastically ever since. That change didn’t come in time for the Nazis, though.